What is the required preload or what are they currently torqueing the nuts to? Are there any space limitations? Attach any drawing or picture of the application. This is only the basic application information and more questions may follow depending on the application itself. What is a multi-jackbolt tensioner? A "Superbolt" or "multi-jackbolt tensioner (MJT)" is a direct replacement for hex nuts, covered nuts, bolts, etc. They spin onto your existing bolt or stud and provide a better way to bolt up your joint. They consist of three components, shown above. Apply between Jackbolt Tips & Washer. 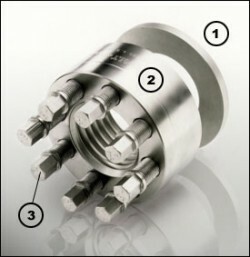 Superbolt multi-jackbolt tensioners (MJTs) replace existing hex nuts. Only hand tools are required for installation and removal of any size tensioner. Safe, accurate and economical! We have a wide range of standard series, as well as an unlimited capacity to create special designs to meet your unique needs. Bolt style Superbolt multi-jackbolt tensioners (MJTs) replace existing studs or bolts. Ideal for applications with tapped holes, or where threading a stud into a nut would be impractical. The outside diameter is smaller than a nut type tensioner on a stud, allowing MJTs to fit into tighter areas. Flexnuts are used in combination with Superbolt tensioners and are designed to flex out at the bottom and flex in toward the top of the nut. This distributes the bolt load along many threads, adds elasticity, and prevents stress concentrations in the first few threads. SMX Mill Motor Nuts are used to replace standard mill motor armature nuts supplied by electric motor manufacturers. SMX tensioners are available for most standard motor frame sizes. Preload matches the hub stress capacity of brake wheels and pulleys.